AegisGuard™ LS Radiation Shields consistently have been proven to provide optimum shielding protection from RF (radiation frequencies) emitted by cell phones and other wireless products and networks, without affecting reception or battery life by deflecting the frequencies away from the body at an angle opposite of the originating source. Scientific reports have been published since mid-2001 addressing the health risks from frequencies far below what is required for cellular phones to communicate. AegisGuard™ Life (L) Series products shield between 5 Hz. - 1.1 THz. frequencies, exceeding the maximum levels specified by Bluetooth, 3G, 4G-LTE, 5G, IoT and 5G standards. In the United States, the Telecommunications Act of 1996 prohibits state or local governments from rejecting proposed cell phone towers based on concerns over the potential health effects of radio frequency emissions, provided those emissions are within the limits established by the Federal Communications Commission. Incredibly, nobody has ever been able to demonstrate the emissions are safe. All phone manufacturers, and the World Health Organization, warn consumers not to use a phone held close to their body, or any shielding product claiming to absorb radiation (all AegisGuard™ Radiation Shields deflect radiation). If metal, conductive or other absorption based shielding material is used, a phone must compensate for a weaker signal by increasing its output power, thus increasing its radiation emissions and battery consumption. Furthermore, absorption based products, like a sponge, seep (leak) as they become saturated, and deteriorate over time. Most people are aware current generation phones have internal antennas and and an earpiece, but are unaware the entire radio system (transmitter, receiver and antenna) generate the radiation. 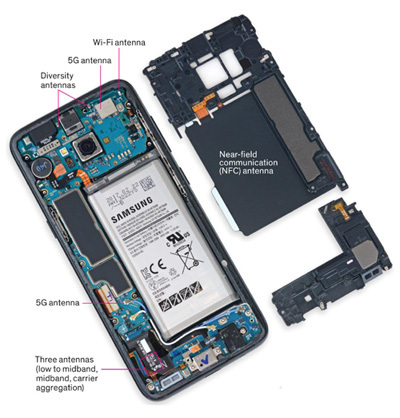 Current phones (4G-LTE, 5G and future models) can have up to 8 internal radio systems. The amount of radiation emitted by the radio system is contingent upon its design, obstructions, and the strength of the signal received from the base station. At least 40% and up to 60% is absorbed by the head and neck. Heat, which serves as the foundation of SAR thermal test procedures used worldwide as the criteria for determining wireless product safety, is also emitted from phones. It is, however, impossible to believe SAR measurements provide an accurate basis for determining health effects attributed to cellular phone radiation because none of these health effects are thermally induced. All AegisGuard™ Radiation Shields are tested at frequencies below, above, and much longer than the frequencies elapsed amount of time associated with wireless phones, and all other wireless products. No other shielding products are tested as thoroughly, or as long, including shielded cases, antenna shields, adhesive style coin and earpiece shields, pendants, etc. In fact, the United States Federal Trade Commission filed charges against companies selling coin size adhesive radiation shields beginning in May, 2003, barring two companies from selling these types of products in the United States.